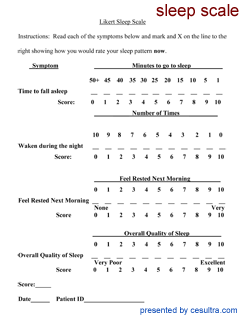 All scales receive the score above the X that the patient placed on each line, with the exception of the Time to Go To Sleep, in which the score is from 0 to 10, with one minute scored 0 and 50+ minutes scored 10. To get the total score for each scale just add the scores of the individual items together. 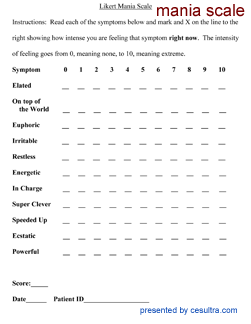 The depression and anxiety scales can be used alone for the study of those disorders, or the depression scale can be used along with the hypomania scale to study emotion swings in bipolar patients. 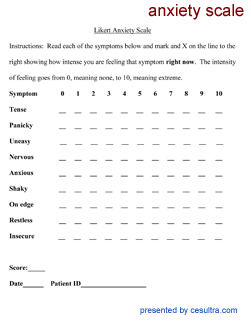 If a patient is to be individually clinically examined, then the percent change score as a result of treatment can be obtained by dividing the pre treatment score into the post treatment score and multiplying the result by 100. Statistician. If a researcher wishes, he can email the scores in two separate groups, such as “group A” and “group B” to Ray Smith at ray.smith@Nastos.com, and he will do the statistical analysis and email the results back, usually within a couple of days. Journal Write-up. If a researcher wishes, Dr. Smith will also write up the study for publication if the researcher will give him the name of the journal he wishes it published in so he can follow that journal’s author’s format. Both of the above services are free for CES studies, though ethically, Dr. Smith has to append his name to the end of a published study he has been involved with. This entry was posted in Anxiety, Depression, Insomnia, Relaxation, Sleep Problems, Stress and tagged ces therapy, ces ultra, cesultra, cranial electrical stimulation, cranial electrotherapy stimulation on August 31, 2013 by cesadmin.